Today marks 25 years with my husband. each day with your husband and children. What a gorgeous couple! 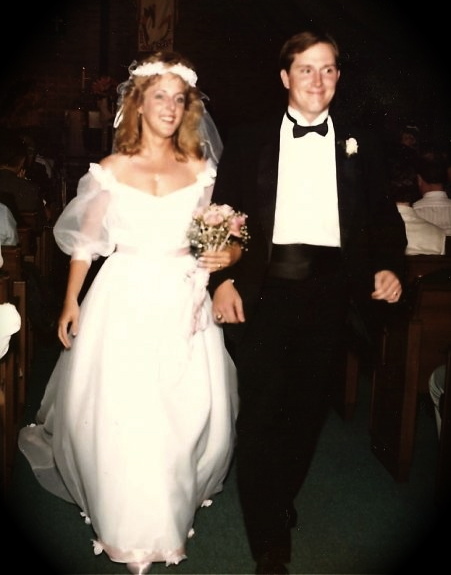 Happy Anniversary and congratulations on 25 years! Beautiful picture of you and your husband. Anniversary Blessings to you both! Time does seem to fly by (and if not careful/aware...just slip away;-( ) Treasure each moment! 44 yrs. for us last January...canNOT fathom that!! Hehe! Congrats on a very special day. Congratulations!! May you be blessed with many more years of wedded bliss. What a darling picture! Happy 25th Anniversary! I hope your special day was just that...extra special! You are a very beautiful bride. Happy anniversary. Happy Anniversary!! What a wonderful picture!! Hope your day was very special! What a sweet picture. Congratulations on 25 years together. We had our 40th anniversary on the 12th of August. I totally agree with you about treasuring each day, that is an important reminder for all of us. Happy anniversary -- and wishing you all the best in your new adventure. Congratulations! (I'm a little late in reading this.) I hope the next 25 years are as wonderful as the first. Congratulations on 25 years! A real milestone!! happy happy anniversary and sweet photo!